Our Products >> 150ft. HO scale Gusseted Bridge Kit. 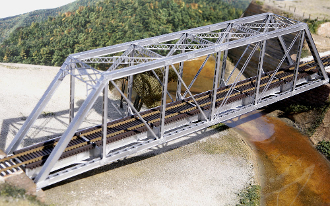 This HO scale Eastern Style Gusseted Girder Bridge is super detailed from a bygone era. Built in the early 1900’s, this bridge is a beautiful work of art and will great upon your diorama, layout, or mantle. She is very much like her 150’ sister bridge, the 1902, except she has square plates on her girders instead of “X’s” for her supports. She is a welcomed addition to our family and hopefully yours. The Gusseted girders included with this kit, can be purchased separately in a package of 5 for custom building many different steel structures and bridges.